A warm welcome to our new Shipwright, Chris Cossor. 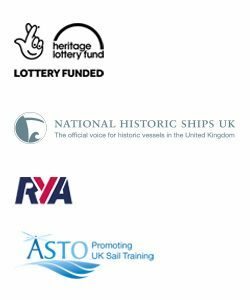 Chris joins us with an impressive background in marine restoration and will work alongside our Project Shipwright, Brian Taylor restoring Boleh and guiding Sam, Will, Henry and Reuben through their apprenticeships. 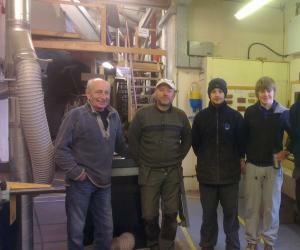 The picture shows Chris with some of the team in the Boleh workshop. Also, a big thank you, again, to Shipwright Richard Uttley. Richard has been instrumental in the restoration of Boleh, successfully completing Stage 1 as Project Shipwright along with our previous apprentices. He also agreed to come back for Stage 2 to help kick off the HLF funded final phase of Boleh’s restoration. Richard is now leaving the Boleh Project to enjoy a long summer touring Europe, but will continue to aid the team on his return.